Olafur Eliasson discusses the role of light and colour in his work as a starting point for phenomenological investigations. The lecture explores questions of authorship, the artist’s position within a network, and the potential to reach out and encounter other groups and people through an artwork. This is the second of four lectures given by the artist in Addis Ababa in the context of an education collaboration between the Institut für Raumexperimente and the Alle School of Fine Arts and Design. Olafur Eliasson, Danish-Icelandic artist, founded the Institut für Raumexperimente, an educational research project, affiliated with the College of Fine Arts at the Berlin University of the Arts (UdK). The fundamental trajectory of the Institut für Raumexperimente is Eliasson’s interest in testing models of learning and cultivating experimental formats. Teil I	Teil II	Teil III	Olafur Eliasson continues his discussion of the challenges confronting contemporary artists, framed in a retrospective on his career so far. Eliasson speaks of the power and effect of environments, the way those environments are constructed and conditioned, and the need to understand one’s environment as a subjective and negotiable event. This is the third of four lectures given by the artist in Addis Ababa in the context of an education collaboration between the Institut für Raumexperimente and the Alle School of Fine Arts and Design. Synthesis Marathon: compilation of independent things that still overlap • Getting into the flow • Navigation is the artists’ challenge • The effect of context on a work of art • Belief • Expand...	Marathon: compilation of independent things that still overlap • Getting into the flow • Navigation is the artists’ challenge • The effect of context on a work of art • Belief • Passion • Noticing emotions reminds us that we are not alone • Unconscious mirroring of emotional environments • Confidence • Glass creating an inside and an outside • Glass as highly alienating and excluding • Looking through walls • Borrowed views in Chinese gardens • Lalibela void • Artists’ ability to see an ‘invisible’ space • Omgivelser, an exhibition in-between walls • Separating artworks from consumer goods • A space where our subconscious can be explored • Your house • The notion of negative spaces as positive spaces • Being so busy making sense of what we see that we don’t see most of what’s out there • Simulating various light conditions to re-exercise our vision • The influence of lighting on our perception of colour • The historical conditioning of white • Associating white with purity: the use of lime in hospitals and the whitewashing of Protestant churches during the Reformation • Experimental set-ups with light: Your relativity of white, The light setup • Room for one colour • Broadening one’s point of view • The feeling that we are not the centre of the universe • Light is not without context • Light as a discursive practice • How a work of art evolves in the world • Art and artists as part of and bound up with an often invisible system	Short biography Olafur Eliasson, Danish-Icelandic artist, founded the Institut für Raumexperimente, an educational research project, Expand...	Olafur Eliasson, Danish-Icelandic artist, founded the Institut für Raumexperimente, an educational research project, affiliated with the College of Fine Arts at the Berlin University of the Arts (UdK). The fundamental trajectory of the Institut für Raumexperimente is Eliasson’s interest in testing models of learning and cultivating experimental formats. part I	part II	part III	Olafur Eliasson führt seine Überlegungen zu den Herausforderungen vor denen zeitgenössische Künstler stehen weiter aus. Er setzt dies in Bezug zu einer Retrospektive seiner bisheriger Arbeiten. Eliasson spricht über die Kraft und den Einfluss, die unsere Umwelt auf uns hat, die Art auf die diese Umgebungen konstruiert und konditioniert sind und das Bedürfnis die eigene Umgebung als subjektives und verhandelbares Ereignis zu verstehen. Der Vortrag ist der dritte von insgesamt vier Vorträgen, die der Künstler im Rahmen einer Zusammenarbeit des Institutes für Raumexperimente mit der Alle School of Fine Arts and Design in Addis Abeba hielt. Synthese Marathon: Zusammenstellung unabhängiger Dinge, die immer noch Schnittpunkte haben • In den Flow kommen • Navigation ist die Herausforderung des Künstlers • Der Effekt von Kontext auf ein Kunstwerk • Glaube • Expand...	Marathon: Zusammenstellung unabhängiger Dinge die immer noch Schnittpunkte haben • In den Flow kommen • Navigation ist die Herausforderung des Künstlers • Der Effekt von Kontext auf ein Kunstwerk • Glaube • Leidenschaft • Gefühle zu bemerken erinnert uns daran, dass wir nicht allein sind • Unbewusstes spiegeln von emotionalen Umgebungen • Zutrauen • Glas, das ein Innen und ein Außen schafft • Glas als zutiefst entfremdend und ausschließend • Durch Wände sehen • "borrowed view" in chinesischen Gärten • Lalibela void • Die Fähigkeit des Künstlers, einen ‘unsichtbaren’ Ort zu sehen • Omgivelser, eine Ausstellung zwischen Wänden • Kunstwerke von Konsumgütern trennen • Ein Ort, an dem unser Unterbewusstes erforscht werden kann • Your house • Das Verständnis von negativen Räumen als positiven Räumen • So beschäftigt damit sein, den Dingen die wir sehen einen Sinn zu geben, dass wir das meiste gar nicht sehen • Simulation verschiedener Lichtverhältnisse um unser Sehen neu zu trainieren • Der Einfluss von Beleuchtung auf unsere Farbsicht • Die historische Konditionierung von Weiß • Assoziation von Weiß mit Reinheit: Der Gebrauch von Kalk in Krankenhäusern und das Weißen evangelischer Kirchen während der Reformation • Experimentelle Aufbauten mit Licht: Your relativity of white, The light setup • Room for one colour • Erweiterung des eigenen Blickwinkels • Das Gefühl, dass wir nicht das Zentrum des Universums sind • Licht ist nicht ohne Kontext • Licht als diskursive Praxis • Wie sich ein Kunstwerk in der Welt entwickelt • Kunst und Künstler als Teil eines oft unsichtbaren Systems, in dem sie verstrickt sind	Kurzbiografie Olafur Eliasson, dänisch-isländischer Künstler, gründete das Institut für Raumexperimente, ein Studien- und Forschungsprojekt, Expand...	Olafur Eliasson, dänisch-isländischer Künstler, gründete das Institut für Raumexperimente, ein Studien- und Forschungsprojekt, das Teil der Fakultät für Bildende Kunst an der Universität der Künste Berlin (UdK) ist. Eliassons Interesse, neue Lernmodelle zu testen und experimentelle Formate zu kultivieren, ist grundlegender Bestandteil des Institutsprogramms. 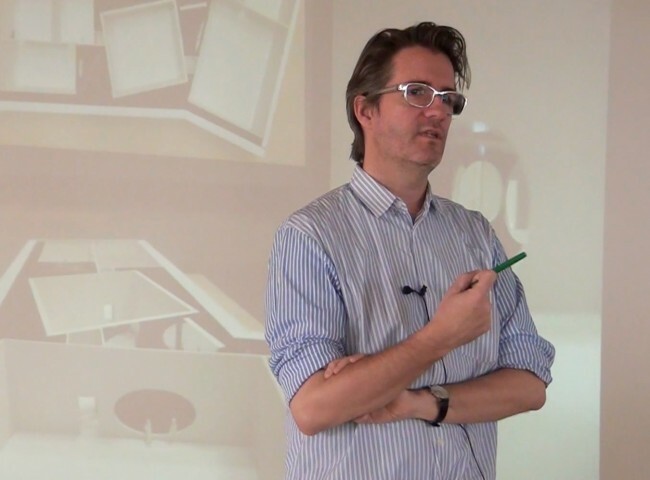 part I	part II	part III	Olafur Eliasson discusses the potential of art education, the importance of connectivity and engagement for art, and art’s responsibility to social involvement. This is the first of four lectures given by the artist in Addis Ababa in the context of an education collaboration between the Institut für Raumexperimente and the Alle School of Fine Arts and Design. Synthesis Reconsidering what a school has the potential to be • The idea of a journey, a trajectory, a progression, and their relation to an art school • Expand... Founder Director of the Institut für Raumexperimente in Berlin • Reconsidering what a school has the potential to be • The idea of a journey, a trajectory, a progression, and their relation to an art school • The need to focus on what is done without becoming obsessed with explanations • Traditional ‘stages of art production’ and how the institute has attempted to circumvent them • ProCoKnow Parliament and artwork production, communication, and knowledge • Artwork is relative to its engagement with the world • Artwork begins with the first feeling • The importance of having the school in Studio Olafur Eliasson and travelling with the school • Connectivity and art • Embodied and felt knowledge • The weather project • The value of collective experience • The ability to see oneself in a context is related to our ability to see oneself from the outside • Models and the relativity of reality • Model room • Your rainbow panorama • Body-artwork and body-environment relationship • Physical knowledge versus mediated knowledge • Erosion • Interventions and changing urban spaces • Artists’ responsibility for involvement and engagement • Movement and surroundings • Demystifying art for politics • Engaging critically with the art market • Double sunset and doing the impossible • Studio-school-museum interaction • Tickling experiment • Institut für Raumexperimente: vibration, connectivity, intersubjectivity • Little Sun and global shared needs	Short biography Olafur Eliasson, Danish-Icelandic artist, founded the Institut für Raumexperimente, an educational research project, Expand...	Olafur Eliasson, Danish-Icelandic artist, founded the Institut für Raumexperimente, an educational research project, affiliated with the College of Fine Arts at the Berlin University of the Arts (UdK). The fundamental trajectory of the Institut für Raumexperimente is Eliasson’s interest in testing models of learning and cultivating experimental formats. Teil I	Teil II	Teil III	Olafur Eliasson spricht über das Potential künstlerischer Bildung, die Wichtigkeit von Verbundenheit und Engagement für Kunst sowie die Veranwortung der Kunst, sich sozial einzubringen. 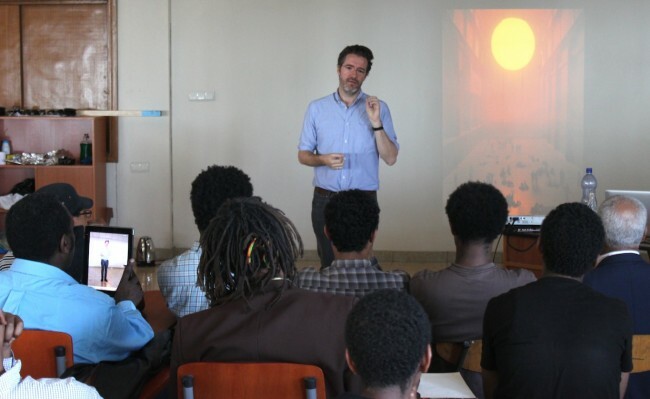 Der Vortrag ist der erste von insgesamt vier Vorträgen, die der Künstler im Rahmen einer Zusammenarbeit des Institutes für Raumexperimente mit der Alle School of Fine Arts and Design in Addis Abeba hielt. Synthese Überdenken, welches Potential in einer Schule steckt; was sie sein kann • Die Vorstellung einer Reise, einer Kurve, einer Entwicklung und deren Beziehung zur Kunsthochschule • Expand...	Gründer und Leiter des Institut für Raumexperimente in Berlin • Überdenken, welches Potential in einer Schule steckt; was sie sein kann • Die Vorstellung einer Reise, einer Kurve, einer Entwicklung und deren Beziehung zur Kunsthochschule • Die Notwendigkeit, sich auf das zu konzentrieren was getan wird ohne besessen von Erklärungen zu werden • Traditionelle Bühnen der Kunstproduktion und wie das Institut versucht hat, diese zu umgehen • ProCoKnow Parliament und Kunstproduktion, Kommunikation und Wissen • Das Kunstwerk steht in Relation zu seinem Engagement in der Welt • Das Kunstwerk beginnt mit einem ersten Gefühl • Die Wichtigkeit, die Schule im Studio Olafur Eliasson zu haben und mit ihr reisen zu können • Vernetzbarkeit und Kunst • Verkörpertes und empfundenes Wissen • The weather project • Der Wert einer kollektiven Erfahrung • Die Fähigkeit, uns in einem Kontext zu sehen ist abhängig von unserer Fähigkeit, uns von außen zu betrachten • Modelle und die Relativität der Realität • Model room • Your rainbow panorama • Körper-Kunstwerk und Körper-Umgebung Beziehungen • Physisches Wissen versus vermitteltes Wissen • Erosion • Erfindungen und sich verändernde urbane Räume • Die Verantwortung von Künstlern für Engagement und Einmischung • Bewegung und Umgebung • Kunst für die Politik entmystifizieren • Kritische Auseinandersetzung mit dem Kunstmarkt • Your new bike • Double sunset und das Unmögliche tun • Interaktionen zwischen Studio, Schule und Museum • Kitzelexperiment • Institut für Raumexperimente: Vibration, Konnektivität, Intersubjektivität • Little Sun und global geteilte Bedürfnisse	Kurzbiografie Olafur Eliasson, dänisch-isländischer Künstler, gründete das Institut für Raumexperimente, ein Studien- und Forschungsprojekt, Expand...	Olafur Eliasson, dänisch-isländischer Künstler, gründete das Institut für Raumexperimente, ein Studien- und Forschungsprojekt, das Teil der Fakultät für Bildende Kunst an der Universität der Künste Berlin (UdK) ist. Eliassons Interesse, neue Lernmodelle zu testen und experimentelle Formate zu kultivieren, ist grundlegender Bestandteil des Institutsprogramms.